This morning was totally dark and it was so cloudy that I had to play peak-a-boo with the sun. So I tried my best and please forgive me if the pictures are not very good in white balance. I made a simple snack bento with my flower shapes rice mold. This time I didn't use cheese for the cheek but I used white boiled egg. And please read Just Bento's Blog about natural ways to coloring foods for bento. Inside the box : sausages wrapped with thin slices ham, chicken karaage, decorated quail eggs, pea pods, and cauliflowers. The rice mold that I used were from my 'Arnest' rice mold collection. 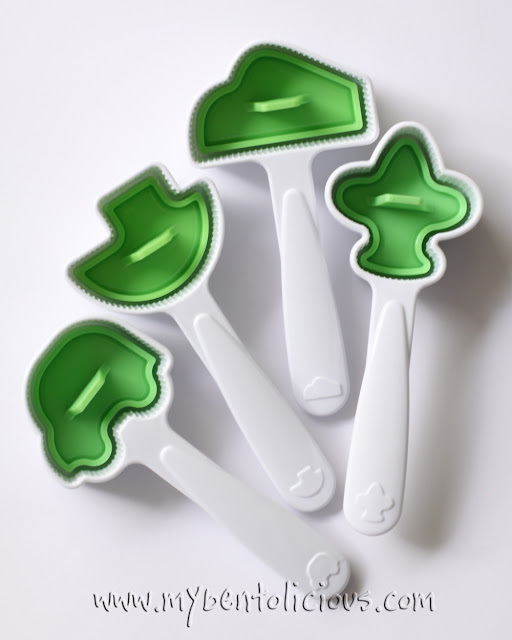 They came in 5 different sets which you can buy separately for each set. I took some pictures below to show what they look like. The yellow-green-pink sets are similar in size that I call it small size, then medium size for the red set, and large size for the orange set. 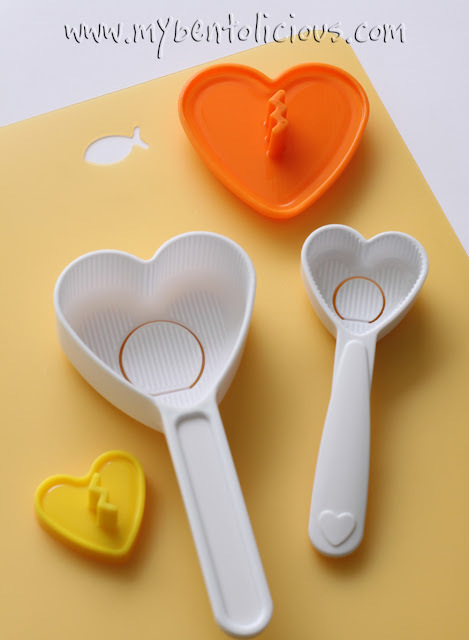 I believe many of you already know on how to use rice mold, but I managed to take some shoots for easy guide on how to use the rice mold. No hand model on the weekdays, so my both hands were used ... and I was using timer on my camera and the tripod so the pictures will not blur. 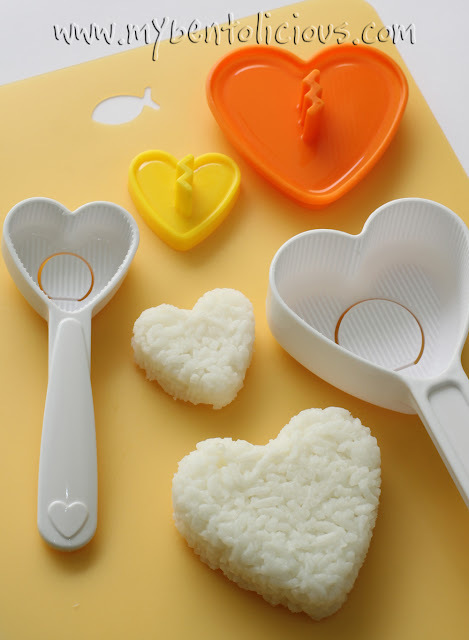 (1) Prepare rice mold that you want to use. 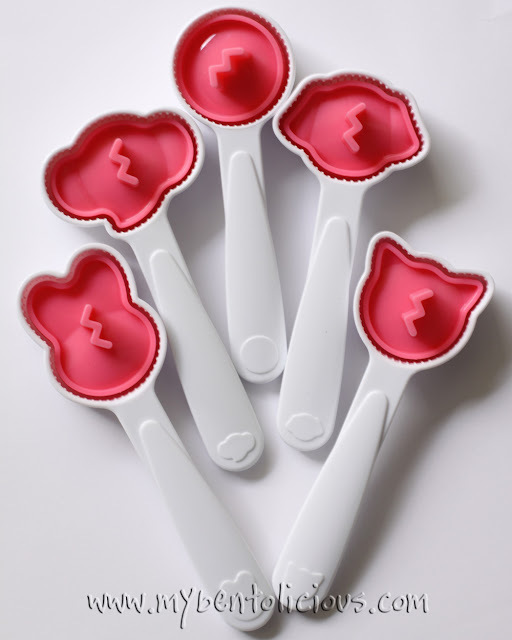 (2) Fill the mold with the cooked rice using small spoon / teaspoon. (3) Press down the lid so the rice becomes solid. 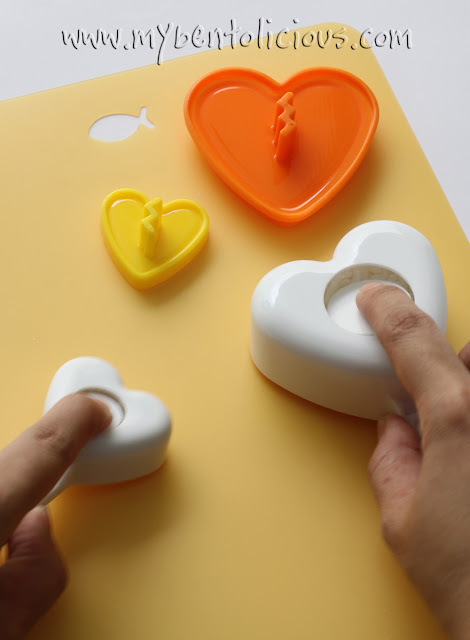 (4) Turn the mold and tap the hole at the back to release the rice from the mold. (5) Now the molded rice is ready. (6) Some of the molds will have a rough surface inside so the rice can easily come out from the rice mold. But some of the rice molds have smooth surface inside. If so, just apply small amount of water or oil on the inside surface before you fill the mold with rice. Jenn from Bento For Kidlet passed me the 'Happy 101' award. 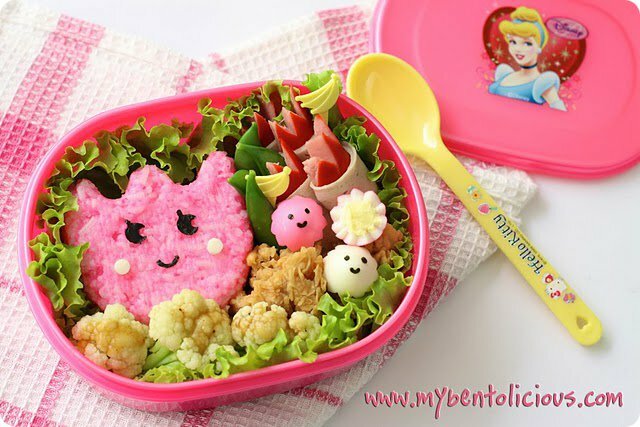 She is an amazing bento mom and is very talented in making bento for her son. I love her skills in drawing cute characters on the cheese using food color markers. I'm happy to know her over the bento blogging. Copy the award image into a post ; List 10 things that make you happy ; Tag 10 bloggers who brighten your day ; Put in a link to their blog ; Notify the award receivers ; Recipients should link back to the sender's blog. (3) Caring family and friends. (5) Traveling with my husband and kids to the places we have never been before. (6) Sleeping ... yes it's so precious to be able to have a good sleep every night. (7) Doing bento - making the bento, shopping for bento, getting new friends from bento, etc. (8) Drinking coffee & chit chat with my best friends. (9) Playing with my gadgets. 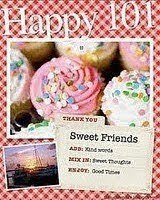 Thanks Lia, i am so honour to receive the 'Happy 101'award from you, appreciate that. @Rachel Hei : No worries Rachel! You deserve it ;o) Please try the color rice sometimes, it's fun ... I forgot to put the link about that (will edit it later), you can read it on Just Bento's Blog. Thank you Lia Chen for passing this "Happy 101" Award. I'm extremely fortunate to have you as a friend. 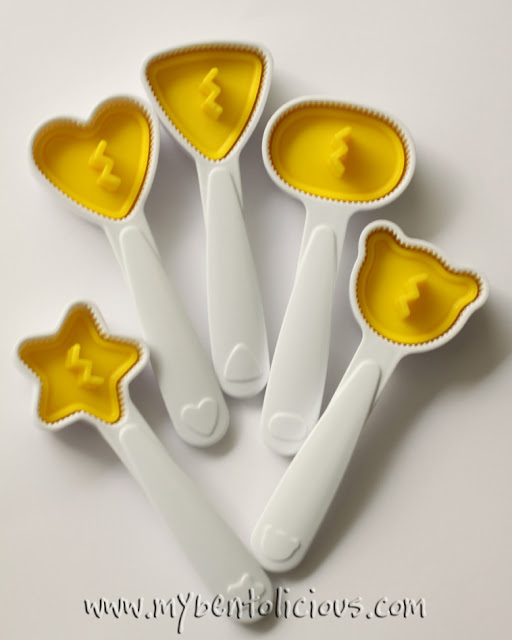 I really love all your rice moulds~ very cute and your tips too. 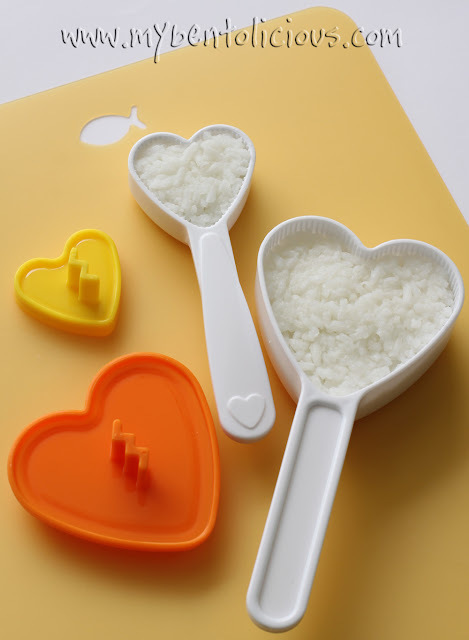 Must I order these rice moulds on line? 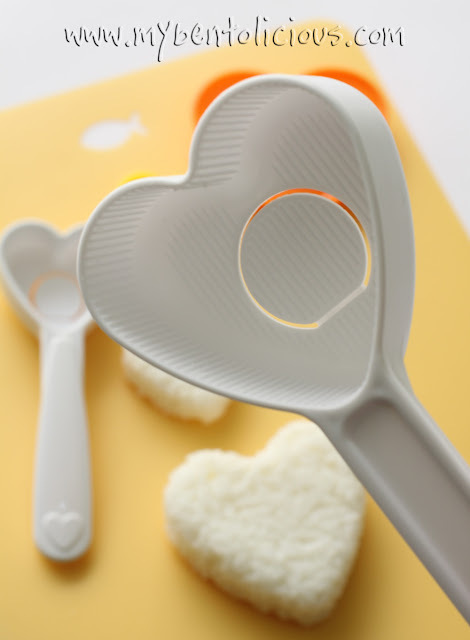 Thank you for posting the rice mold tips! Really beautiful box! I am going to have to look for quail eggs. @Anncoo : Me too Anncoo! It's great to have you as a blogging friend. You can check on Bento Craft for online order (from Malaysia) or on e-bay and J-List ... they usually have it. 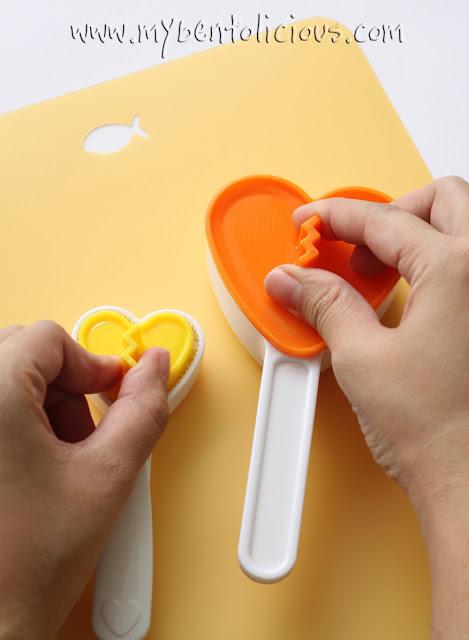 I don't know where to get bento tools in Singapore except Daiso but those molds will definitely not sold in Daiso. @Ribbonlicious : Thanks for leaving your comment here :) Hope the tips is useful. I love those rice molds! I have never used one with handle like that before but it looks like it would be easier to get the rice out of the mold that way! I would like to give an Award for you. Please come and pick it at my place. Thanks Lia for passing this award to me. I'm honoured. Thanks Lia for passing me the 'Happy 101' award! I'm so glad that I have you as a blogger friend (thanks for leaving me the message in the first place!). 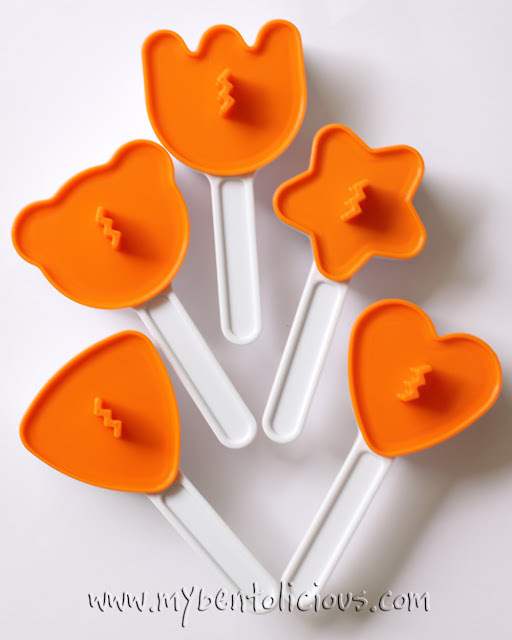 Great tutorial on using these rice molds! Your bento is gorgeous as usual and I coudn't tell that you had any lighting problems. I enjoy visiting your blog lia, so much beauty and educational as well. Your bento is so cute! Also love your tutorials, 'cuz I get to see your fun tools and the proper way to use them! Love to find more about you, and we have lots in common, including passing time with coffee and friends. I did a lot of that as a single person, less time now! Thank you for sharing! Beautiful bento Lia! And all of those great rice molds!!! :D It's nice to know a little bit about you. Great bento! Love the pink rice I need to try coloring my rice sometime! love this sweet bento, the colors really pop! Lia, thanks for passing the award to me, it's my pleasure and I really appreciate it. 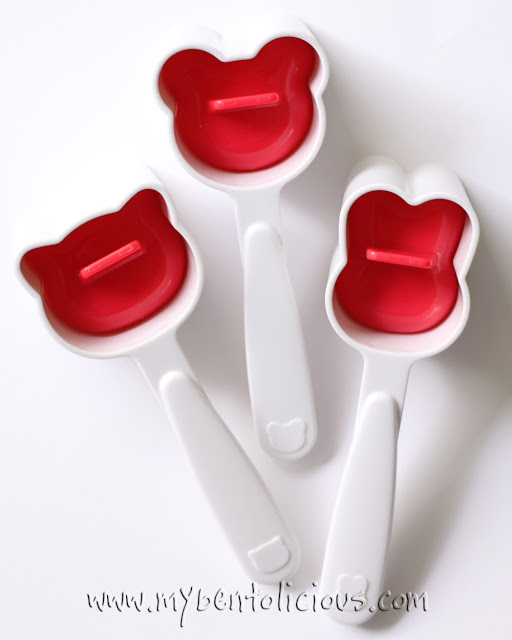 Another collection u have - rice mould. Wau!!!!! @gamene : Thanks a lot Megan! @Vanessa : Your welcome Vanessa!